We are delighted to announce that the Canadian Warplane Heritage Museum Avro Lancaster Mk X will fly in tandem with the Battle of Britain Memorial Flight Avro Lancaster at The Duxford Air Show on Sunday 14 September; a truly historicmoment. 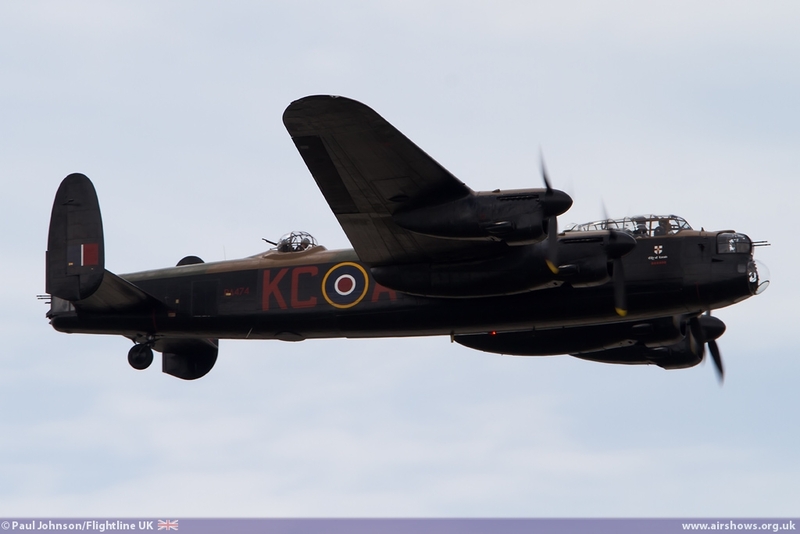 Probably themost famous Allied bomber of the Second World War, the Avro Lancaster had impressive flying characteristics and operational performance. Thousands of Canadian airmen and ground crew served with the Royal Canadian Air Force (RCAF) and Royal Air Force (RAF)Lancaster squadrons in England during the Second World War. By late 1944, the Canadian No.6 Group of Bomber Command operated 13 squadrons of Lancasters. The Canadian Warplane Heritage Museum’s Lancaster Mk X was built at Victory Aircraft, Malton, Ontario, Canada in July 1945 and was later converted to a RCAF 10MR configuration. In 1952, it suffered a serious accident and received a replacement wing from a Lancaster that had flown in combat over Germany. It served as amaritime patrol aircraft with No.405 Squadron, Greenwood, Nova Scotia and No.107 Rescue Unit, Torbay, Newfoundland formany years. The aircraft was retired fromthe Royal Canadian Air Force in late 1963. Following complete restoration, the Lancaster flew again on 24 September 1988. It is dedicated to Pilot Officer Andrew Mynarski and is painted in the colours of his aircraft KB726-VR-A, which flew with the Royal Canadian Air Force No.419 (Moose) Squadron. Andrew Mynarski won the Victoria Cross on 13 June 1944, when his Lancaster was shot down in flames by a German night fighter. As the bomber fell, he attempted to free the tail gunner trapped in the rear turret of the blazing and out-of-control aircraft. The tail gunner miraculously survived the crash and lived to tell the story, but sadly Andrew Mynarski died fromhis severe burns. Flying in tandem with the Canadian Warplane Heritage MuseumLancaster is the Battle of Britain Memorial Flight’s Avro Lancaster PA474, the only other remaining airworthy Lancaster in the world today. Lancaster PA474 rolled off the production line at the Vickers Armstrong Broughton factory at Hawarden airfield, Chester on 31 May 1945, after the war in Europe came to an end. It was prepared for use against the Japanese as part of the ‘Tiger Force’. However, the war in the Far East ended before the aircraft could be deployed and it did not take part in hostilities. It was assigned to aerial survey duties with No.82 Squadron in East and South Africa from September 1948 to February 1952. In 1964, PA474 was adopted by the RAF Air Historical Branch and, during this period, took part in two films, Operation Crossbow and The Guns of Navarone. Permission to fly PA474 regularly was granted in 1967 and the Lancaster underwent an extensive restoration. The Lancaster joined the Battle of Britain Memorial Flight in November 1973 and restoration work on the aircraft has continued ever since. The Lancaster is currently painted to represent Lancaster DV385 Thumper Mk III of No.617 Squadron, famously known as The Dambusters. Thumper was one of the brand-new standard Lancasters issued to the squadron after the Dams Raid in 1943. Formany of the aircraft’s operations it was flown by a crew led by pilot Bob Knights. Many of Bob’s crew had nearly reached a total of 30 operations, which would mean some rest and recuperation. The crew decided that they were safer together and so volunteered for a second operational tour, this time flying Lancaster DV385. In total, Bob Knights flew 41 ‘ops’ with No.617 Squadron, 29 of themin Thumper Mk III, and many of them amongst the unit’smost challenging precision bombing operations. He also took part in all three Lancaster raids against the Tirpitz. In December 1944, after flying an official total of 67 bombing raids, Bob was rested. In January 1945, he was awarded the Distinguished Service Order. During his time with 617 Squadron, eight of the unit’s Lancasters failed to return fromoperations and another had been lost in an accident. 32 of his fellow aircrew had been killed and more had been injured or became prisoners of war. Also from the Avro stable of aircraft, Vulcan XH558, operated by the Vulcan to the Sky Trust, will fly at The Duxford Air Show on Saturday 13 September. XH588 was the first Vulcan B Mark 2 to be delivered to the RAF and was the last Vulcan to leave RAF service after a sterling 33 years in service. It is now the oldest complete Vulcan in the world. The aircraft’s final flight was on 23 March 1993 to Bruntingthorpe Aerodrome in Leicestershire, having been sold by the Ministry of Defence to C Walton Ltd, a family firmwho purchased and maintained the aircraft with the aspiration that itmight fly again. In 1997, a small team, headed by Dr Robert Pleming, started to put together a plan to return the Vulcan to flight. 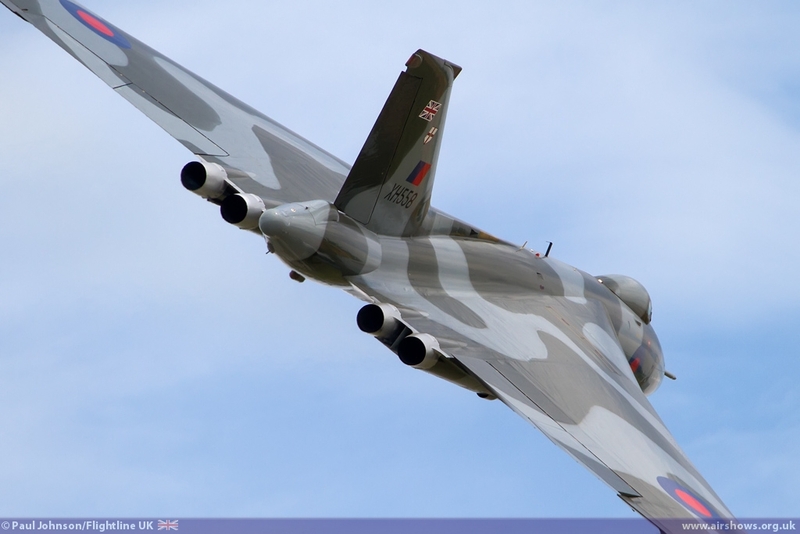 In 1998, Marshall of Cambridge Aerospace was identified as having the skills, capabilities, quality control and experience in one-off aircraft projects to undertake the Vulcan restoration project. On 31 August 2006, XH558 rolled out of the hangar for the first time in seven years and has been thrilling air show visitors ever since. B-17 Flying Fortress Sally B is well-known and loved by visitors to IWMDuxford. The UK’s last remaining airworthy B-17, the aircraft is a flying memorial to the 79,000 Allied airmen who lost their lives in Europe during the Second World War. Built as Boeing B-17G-105-VE c/n 8693, the future Sally B was one of the last B-17s to be constructed by the Lockheed-Vega plant at Burbank, California. Accepted by the United States Army Air Force (USAAF) on 19 June 1945 it was too late to see service in the Second World War. Converted for training purposes, it was based at Wright Field, Ohio from November 1945. It was used for a variety of research roles before being purchased by the Institut Geographique National in November 1954. Sally B was brought to Britain and to IWM Duxford in 1975 and has been permanently based at the museum for almost 40 years under the ownership and care of the B-17 Preservation Trust. 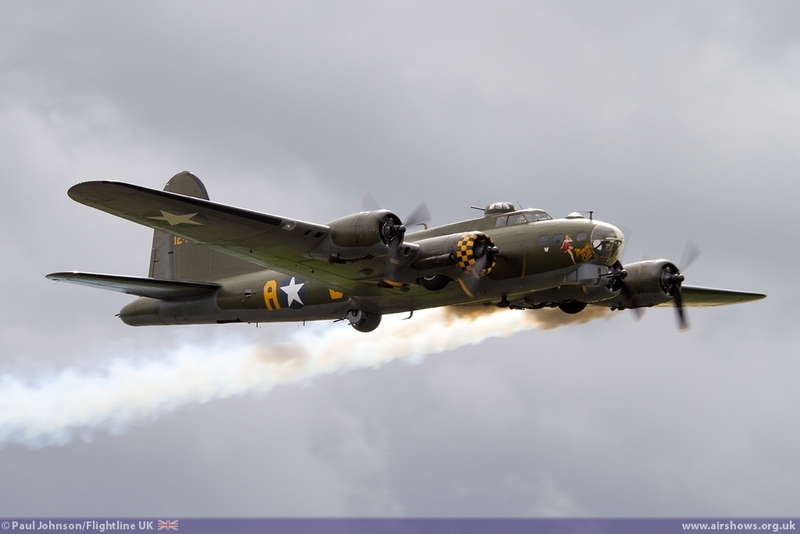 Sally B has starred in many films and television productions including Memphis Belle, Black Book and Bomber Crew. See these and many more iconic aircraft take to the skies at The Duxford Air Show on Saturday 13 and Sunday 14 September 2014.